So, I told her that I would be happy to talk about it, but that I would have no pictures to back it up. I will start off talking about the parties I do by saying this: to me, the food is the most important aspect of the party. If food is good, if drinks are fun, if you have good people, you almost always will have a good party – especially now that Kaylee’s older. The boys’ parties still require an effort toward games/prizes, but that’s another post. A couple of weeks ago, Kaylee gave me her preferred menu. She wanted to do a “make your own pizza” bar, serve hot wings, have a fruit pizza, a vegetable tray, homemade pico de gallo and homemade guacamole with tortilla chips, homemade French onion dip with potato chips, a 7-layer hummus dip I make with pita chips, and cake pops instead of a cake. 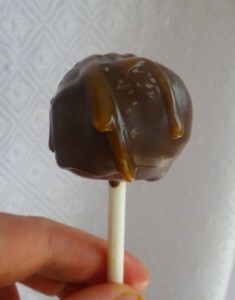 I’d never made cake pops before, so I did some research and settled on two kinds: white cake with a vanilla buttercream and tinted vanilla shell with colorful sprinkles, and a brown sugar cake with salted caramel buttercream and a chocolate shell with a salted caramel drizzle. 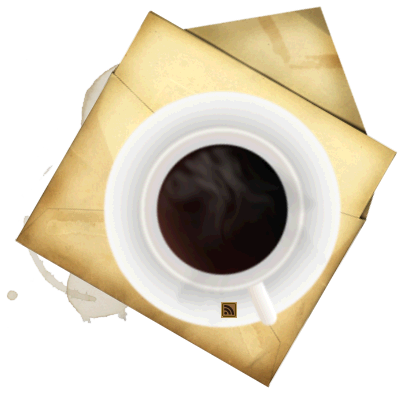 I found both recipes at 52 Kitchen Adventures Blog. I made the cakes and mixed the crumbs with the buttercream early in the week and put them in the fridge. What I learned from that adventure was this: I should have made the salted caramel cake balls then put them in the fridge (or freezer). Lesson learned. With the vanilla cake, I pressed it flat, then used cookie cutters to cut “1’s” and “6’s”. Those I did freeze early, and that worked just fine. 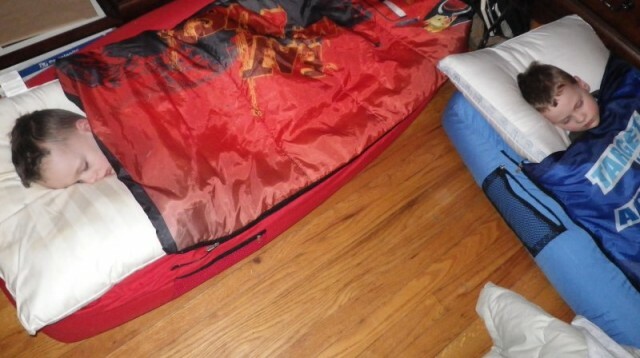 On Wednesday, it occurred to me that I had about ten girls coming to spend the night and we have tile or hard wood floors – not really conducive to just throwing a sleeping bag down. So, I put a call out on social media and local friends responded with air mattresses for me. I did an inventory and made sure I had enough bedding and pillows. The day before the Friday party, I went shopping for my ingredients. I mainly shopped at Meijer and Trader Joe’s — their produce prices rival Whole Foods, and it saved me an extra stop just to get it all within those two places. For drinks, I bought Trader Joe’s “vintage” sodas in orange creme, cola, and root beer. I also bought a couple six-packs of Ale-8, a local soda that is bottled about two miles from my house. I went to Party City to find “Sweet 16” decorations, but their supply was sorely lacking. My only options were hot pink and black – not my first choice – and their prices were unreasonably high. So, I bought the least I could buy and went to a discount store and bought the remainder of the decorations using plain colors to match the theme. 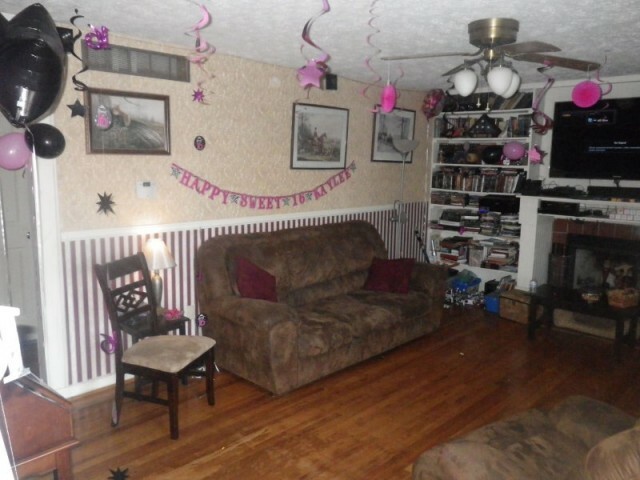 The night before, I decorated as much of the house as I had energy to decorate. I kept it simple – just balloons and dangly things from the ceiling. Like I said — it’s my opinion that the food is the heart of a good party (if you have good people). 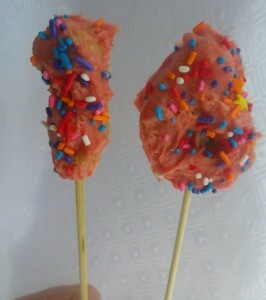 The morning of the party, I started working on cake pops. About four hours later, I emerged from what I called “cake pop hell”, determined that I would never do them again. The effort was incredible, but the results were visually appealing. My personal opinion was that the vanilla cake pops (the 16’s) were really good, but the salted caramel was incredibly rich. But, Kaylee was pleased, and that’s what matters. I made the sugar cookie crust for the fruit pizza, and while it was baking I finished decorating then worked on the rest of the party food. 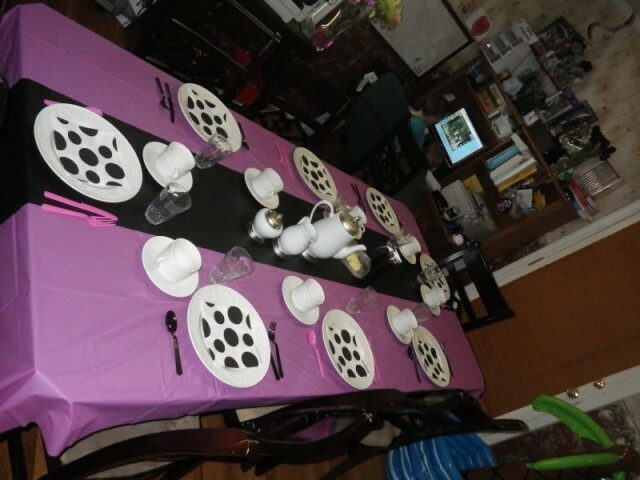 I put tablecloths on the tables, and as I finished each dish, I just went ahead and set it out. By the time I picked Kaylee up from tennis practice, nearly everything was ready. For the make your own pizza bar, I set out toppings — turkey ham, turkey Italian sausage, turkey pepperoni, shredded Mozzerella, shredded fresh Parmesean, sliced purple onions, sliced green peppers, black olives, mushrooms, fresh pineapple, fresh tomatoes — I even had a can of anchovies (that, strangely, no one wanted). I made a quadruple batch of pizza dough (which was too much – I could have done a triple or a maybe even a double), then rolled out pizzas that were about five inches in diameter. I was able to do four at a time on flat sheet pans, so the girls just came in batches and we baked them as fast as we made them. When it was all over, I made one big pizza and set it out so if anyone was hungry again, they could just help themselves. I cleaned the kitchen, blew up air mattresses and made up enough beds between Kaylee’s room and the boys’ room for 10 girls to sleep, set the boys up in my bedroom, and Gregg and I crashed around midnight. The last batch of girls (four of them) all finally fell asleep around four. 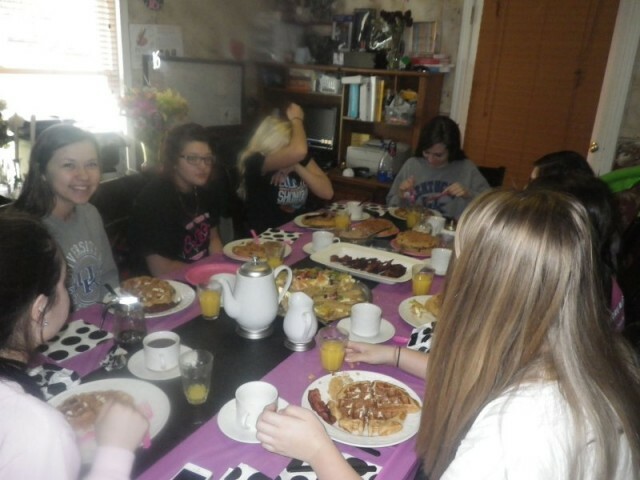 The next morning, I reset the dining room and set the table for breakfast. Gregg and I brewed a few batches of coffee, fried 2 pounds of beef bacon, 1 pound of turkey bacon, and made chocolate chip waffles with chocolate whipped cream. There was also the leftover fruit pizza that got inhaled. By 11:00, everyone was gone, and dishwasher load number three was running, and we all kind of deflated, lying around until we had to meet a friend at five for dinner. All in all, it was a great party. It’s awesome to overhear your daughter, at her Sweet 16 party, talking with her friends about their favorite Bible verses. It makes me pleased at how she’s turning out and the quality of friends with which she surrounds herself. LOVE this!! 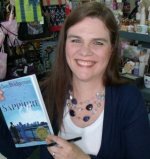 You are an awesome mom–and I’m sure your 16 year old thinks so too! Very cool. I think the food is the most important part, too. 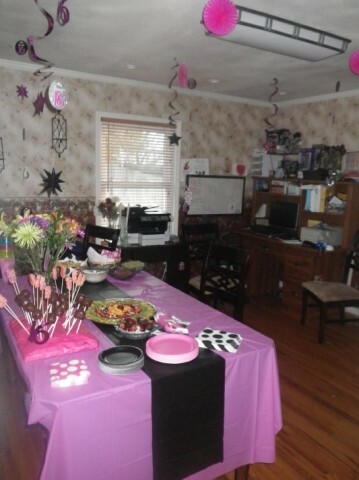 I’m not very good at decorating so I try to have GREAT food whenever I throw a party. Hopefully that makes up for the lack of decorating.